Facts and information about the History of Clothing, jewelry and regalia of Native American Indians and their Glass Beads. Native American jewelry featured necklaces, earrings, bracelets and rings made from many different materials including Glass Beads. Glass beads were first introduced to Native Americans in the 16th Century with the arrival of the early explorers and colonists. They were first used as gifts of friendship and then for trade. 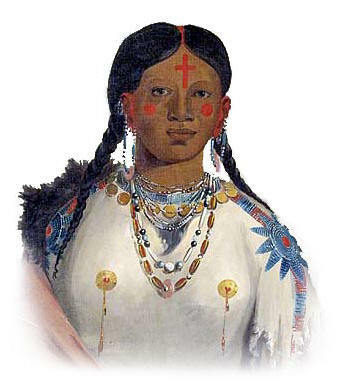 Native Americans soon became particularly adept at beadwork and glass beads were used to adorn many different articles of clothing and used to decorate sashes, garters, belts, knife sheaf, cradles and many types of bags and pouches. Glass Beads Fact 4: This type of decoration originated in Venice, Italy, the glass making center of Europe. Glass Beads Fact 5: They were transported across North America to traders by pony-pack trains and were given the nickname of "pony beads". They were also referred to as 'Hudson's Bay Beads' as the biggest trading company.